Short selling are transactions in which investors sell borrowed securities in anticipation of a price decline and are then required to return an equal number of shares at some point in the future. Let’s assume you are bearish on a stock that is currently trading at $50 per share. You then sell 1000 shares short or shares that you don’t currently own at that market price. $50,000 is generated into your brokerage account. If you are right and the stock drops in value, let’s say to $45, you can now purchase 1000 shares at $45 to replace the borrowed shares. Your profit is then $5000 ($50,000 – $45,000). I am not recommending short selling particularly to novice investors. Short selling is an advanced trading strategy with many risks and pitfalls and this strategy includes unlimited losses. A share price can only fall to zero, but there is no limit to the amount it can appreciate. There are margin rule requirements for a short sale in which 150% of the value of the shares shorted needs to be initially held in the account. Therefore, if the value is $50,000, the initial margin requirement is $75,000 (which includes the $50,000 of proceeds from the short sale). This prevents the proceeds from the sale from being used to purchase other shares before the borrowed shares are returned. There are two types of short-selling. Generally speaking, a typical short sale involves the sale of a stock which, although you do not own, you either borrow (usually from your brokerage firm) or enter into a good faith arrangement to borrow. The stock a short seller borrows is then required to be delivered to the buyer’s clearing firm by the close of business on the settlement date, which is three days after the trade date, universally known in the securities industry as “T+3”. In a naked short sale (the second type of short sale), the seller does not borrow or arrange to borrow the securities in time to make delivery to the buyer by T+3. As a result, the short seller fails to deliver the securities to the buyer when delivery is due, which is known as a “failure to deliver” or a “fail.” In theory, drastic cases of naked shorting can create a virtually unlimited quantity of shares (because the shares are never borrowed or delivered), and obviously, a market predicated upon supply and demand can suffer grave negative implications in such a scenario. “Bad actors” who engage in naked short selling may use the additional leverage (of not borrowing or delivering the security) to artificially depress the price of a security, which can coincide with other negative implications, such as depriving purchasers of voting rights for example. How rampant are the abuses by “bad actors”? While there is no question that short selling has been abused by bad actors, I respectfully disagree with the notion that short selling is used “mostly as a vehicle for abuse.” In fact, my understanding is that the vast majority of short sales are legal. In my opinion, the primary concern in connection with short selling arises in the context of abusive naked short selling, not short sales in which shares are legitimately borrowed and timely delivered. That said, I believe short selling enhances liquidity and pricing efficiency in the markets. 1- Short Sellers prevent stocks from getting overpriced. 2- When companies fight short sellers, short sellers are usually vindicated. 3- Companies that fight with short sellers tend to underperform the market. 4- Volume of shorting has increased dramatically mostly due to the activity of hedge funds. 5- Shorting allows options market makers to hedge their options market-making positions and therefore maintain strong options liquidity. What is the SEC doing about naked short selling? The SEC has recently implemented regulations which will significantly curtail abusive naked short selling. For example, effective October 17, 2008, the SEC adopted Rule 10b-21, which is a naked short selling antifraud rule that expressly targets fraudulent short selling transactions. On July 31, 2009 (and most significantly in my opinion), the SEC adopted Rule 204 to Regulation SHO, which, notwithstanding limited exceptions, now requires mandatory close-outs on T+4 for fails resulting from short sales (the close out requirements were much more lenient before Rule 204). In addition, on February 24, 2010, the SEC also adopted an alternative uptick rule (Rule 201) as part of the continuing efforts to curtail abusive shorting. This replaced Rule 10a-1, better known as the “uptick rule”, which was repealed in 2007. The new alternative uptick rule involves circuit breakers and is triggered by a 10% decline in a security. While these new regulations will not completely eliminate abuse in the short selling arena, I believe they will significantly curtail the same. There are several technical market theories (to be discussed in more detail in my upcoming book) that profess to predict future movement of the equity being analyzed. One such theory is called the short interest theory. This theory states that a larger short interest is the predecessor of an increase in the price of a stock. Since a short sale is the sale of a stock not owned by the seller, an investor who sells a security short borrows that security from a broker and then sells the borrowed security without having ever actually owned the same. The short-seller must eventually buy the security back, or “close” the open short position. This is buying waiting to happen. Short interest is the number of shares sold short that have yet to be covered. As noted, shares ultimately will need to be purchased after they are sold short to cover the short position. Some short sellers who fear a decline in the price of a short security may cover their positions sooner than anticipated or suddenly as bullish news regarding the underlying security is perceived. This is called a short squeeze. A rising short interest is considered a bullish indicator. Type in ticker and look for “key statistics”. Anything over 10% is considered high and over 20% extremely high and therefore quite bullish. There are many investors who believe the current regulations do not go far enough, and that other/additional restrictions should be enacted. It would be impossible for me (or anyone for that matter) to definitively opine whether this point of view, or the alternative, is right or wrong, or whether the current state of the law will have its intended effect in full. I certainly believe the regulations will, particularly in light of Rule 204, which focuses on the clearance and settlement process where, in my opinion, abusive short selling is most likely to appear. With appropriate regulations in place, the good appears to outweigh the bad. Stocks suffered their largest losses in months on Friday as a result of the uncertainty created by the chaos in Egypt. The globalization of our economy means that it DOES matter what goes on in other parts of the world and this was such an example. Our BCI system has a strict series of fundamental, technical and common sense screens that lead to our weekly published stock screen and watch list. As a result of Friday’s market decline many of the technical trend and momentum parameters were not met and only 1 stock (XEC) passed ALL screens. Please note that XEC is NOT eligible for a covered call write until after the 2-16 earnings is reported. Stocks that pass all fundamental screens but have mixed technicals are also eligible but conservative investors may opt for in-the-money strikes for additional protection. There are many such stocks located in this week’s “running list”. ***Premium members: This information is archived in the “resources/downloads” section of your premium site. For the week, the S&P 500 dropped by 0.5% for a year-to-date return of 1.6%. An increasing market volatility (VIX) normally has a negative impact on the price movement of the general market (S&P 500). Since this is a small sample it raises an eyebrow but (in my view) is no reason to conclude that the market is turning bearish. Thanks for offering another perspective. This site is all about sharing information and constructive opinions. There are those who feel that when a stock is heavily shorted those short sellers will be right more often than wrong. Others feel a short squeeze could be a huge positive for the stock and the required stock replacement will be another positive. Whichever perspective you subscribe to, a significant short interest represents potential volatility for covered call writers and conservative investors may want to factor that into their stock selection decisions. Applying the 20% close out rule on IM options..
One of BCI’s monitoring rules is to close out covered call option positions when the current value of the option falls to 20% of the premium received during the first two to three weeks of the option period. When applying this rule to IM options, do you include or exclude the intrinsic portion of the option? For example, if I sold a IM covered call for $3.00, with $1.00 of that being intrinsic value, would the 20% rule kick in when the option value fell to $.60 (20% of $3) or when it fell to $.40 (20% of the $2 non intrinsic value of the premium)? The 20% or 10% is taken from the entire option premium for I-T-M or O-T-M strikes. The reason that the 20%/10% guideline works for both I-T-M and O-T-M strikes has to do with the different deltas each option is associated with. Delta is the amount of change in an option value for every $1 change in share price. I-T-M strikes have the highest deltas (between .8 and 1.0) and O-T-M strikes the lowest (.2 to .3). A-T-M strikes are in between. 1- We own a stock @ $53 and sell the I-T-M $50 call for $4. Let’s assign a delta of .8 to this call which means the option will drop $.80 in value for every $1 of share depreciation. If the stock drops by $4 to $49 the option value could be $.80 ($4 – $3.20). This will meet our 20% guideline. 2- We own a stock @ $48 and sell the O-T-M $50 strike @ $1.50. We will assign a delta of .3 to this option. If this stock also drops $4 in value to $44 the corresponding option value will be $.30 ($1.50 – $1.20) which also meets our 20% guideline. Now although these stats were created to make a point, the deltas are accurate and the option returns and protection are reasonable. The point isn’t to examine these figures in detail but rather understand the relationship between strike price and delta and why that makes the 20%/10% guidelines applicable in most situations. 5- Protection against extreme losses from “high implied volatility” options. Please keep in mind that these are general guidelines that will have appropriate application in a majority of scenarios. We always have available the exit strategy of exiting a position at any time if we have concern for the underlying for any reason. The basic concept behind the 10 to 20% suggestion is that the amount left to earn on the position has gotten so small that continuing to maintain the position really is removing more profitable choices. It really doesn’t matter if it is intrinsic or extrinsic value. In your example above you should be looking to your alternaltive investments. Let’s say you have an alternative transaction that will potentially earn you $1.37 per share. You choice is keeping the position you have to squeeze out the last $0.60 or $0.40 per share, or close this position and open the new one. If you cannot find a better alternative, simply letting the current one play out may be a better choice. There is another view, as well. If I have only $0.60 or $0.40 left in the deal, what is the risk that the stock could get hit in the time remaining? If you have a $2.00 gain, risking some of it to get the last $0.60 may not be a risk that should be taken. I agree with Jeff and Alan on how to view short sales. Many short sellers are very good at looking behind the facade of the financial statements and the company statements. They come the conclusion that the numbers don’t make sense, or the company’s sales projections are not sustainable, etc. Look at the discussion that went on last month about Netflix. The short sellers maintained that Netflix could not continue racking up the sales it had been and that the producers of the shows were going to be asking for more money from Netflix. Whether, or not, they were correct has yet to be seen, but the earnings were terrific last week. Short sellers have a dual function in the market. The tend to dampen excessive enthusiasm for a stock and they tend to keep company managements a bit more honest. I view large percentages of short positions as a warning. Short sellers are not always right. It is when they sniff a true scam, such as Worldcom, that they get tremendous press. What I watch for is a sizeable short position on a stock I have a positive view of. It means that, if the stock begins to rise, the short sellers will be adding to the buying in order to cover their positions and stop their losses. Remember, if you buy a stock at $60, and sell it at $65, you made $5. If a short seller sells the stock at $60, and it goes to $65, he has lost $5. You won’t be able to tell if the $65 buyer thinks it will go to $70, or the buyer is just cutting his short sale losses. All you will know is that there are two buyers who want that stock, instead of only one. I am a new member and want to thank you for this article. I hear a lot about short selling stocks but never really understood how it worked. This article nails it down for me. Just a reminder to those who watch the option volumes. Many short sellers use options to cover their positions. Example: I think IBM will drop to $230. It is currently around $159. I borrow 1,000 shares from my broker and sell the shares. Now, my upside loss is infinity. If the stock suddenly jumps to $259 I am out $100,000 and my broker is extremely unhappy. So, to protect myself from a huge increase in price, I spend $500 for “insurance”. I buy 10 Feb $165 call options for $0.50 per share. Since some people view option activity as a bullish or bearish signal, you might get the impression that somebody thinks IBM will go higher than $165, when in fact, just the opposite is true. Just something to contemplate so you don’t get too fixated on what “signals” mean. In some countries giving a “thumbs up” is the same as our one finger salute. Same signal. Different meaning. Sorry. That “drop to $230” should be $130. Typo. This is my first post. A little off topic from the article but I wanted to introduce myself and maybe become a contributing member. I’ve learned a lot from Alan and the contributing community. Thank you. Prior to Apr 2010 – On my own investing mainly in stocks and very little options. Breaking even and maybe losing a little money. Apr to Oct 2010 – Picked up “Exit Strategies…” and am an active reader of the articles and blog posts. Had my own selection of stocks and whatever I can find on this blog and other news articles. Improved my returns but inconsistent. Oct 2010 to now – I am enjoying the consistent profits I’ve been making. The weekly reports are a game changer. The learning and continuing learning experiences are priceless. I read about this in BCI’s blog somewhere before but never took notice because it wasn’t relevant at the time. I can assure you I am very familiar with it now. Before earnings, IV shot up, raising the premium via the extrinsic value. After earnings, IV drops, lowering the premium. After making consistent profits from using the BCI covered call system, I became adventurous and used the profits to speculate. * when I checked my option strike premium the following day, the stock price went up by $1 but my premium actually went down. I have a loss!!! * From what I read, I made an options trader’s rookie mistake. I learned my lesson and move on. A revised Weekly Report has been uploaded to the Premium Site. Look for Weekly Stock Screen And Watch List 01/28/11 RevB. The data is the same but we have made some improvements in readability. Is it possible to make a living on selling covered calls? Currently im a “little” of that amount. But im looking at retiring some time in the next 5 years and living of this beast! I am retired and derive approximately 20% of my retirement income thru cc writing. The thing to remember is that diversification is key. For example I derive income in retirement from various sources including bond and other fixed income investments, real estate, pensions, cc writing, etc. 2010 was a good year if you were invested in stocks, but I only used about a quarter of what I made in the market to live on and saved the rest for a rainy day, month or year. After the 2008 debacle I want to be conservative. Just my .02. Others here may have a different view. Good luck. I am especially proud of and thankful to the BCI team which spends many hours each weekend providing this valuable information to our members. and welcome in the BCI family. Your story sounds a little bit like mine. Made some Money on Options in 1998 and 1999 (pure luck) and lost it all and more in 2000. Stayed away from trading up to 2009. Through a member of this community I got notice of Alan’s CCC book. That was in October last last year. I went through Amazon to see the contents and ordered right away the CCC book and the Exit book. I even did not follow strictly the rules and made more money than ever before. And consistently. At first I thought, the stocks in the weekly premium list where very pricey for me. But after some went down during the CC writing cycle, they always came back up and I learned to value the thorough selection of only the best of the best. I learned tremendously from BCI family members and am still learning. Even, if you get bitten sometimes by Owen and it leaves a little scar, but his comments are honest, useful and we all can profit from his experience and knowledge. I don’t bite. I may disagree, but if I ws right all the time I would not share it with anyone (the Feds might notice). Thanks Dirk (#17). Really appreciate it. I must say, the BCI community exceeded my expectations as forum/blog posts goes. Alan encourages education and learning new strategies. There are no such things as dumb questions here. Everyone is supportive and willing to help each other out. Looks like I found my options trading family. First I want to agree with Ken about finding a home on this site. I am learning so much. Thanks to everyone who participates. Alan I just finished reading both books and was wondering when your next book will be available. Ok, for those of you who look at high priced stocks and wish you had enough money to enter a covered call, here is a spread example I currently own. On March 25, with IBM at $160.08, I bought 2 Feb $155 calls for $5.97 and sold 2 Feb $160 calls for $2.53. How is this different from buying 200 shares of IBM at $160.08, and selling the $160 calls? Well, for one thing I did not have to lay out $32,016 to buy the stock. Since the spread is $5 between the strikes, and I entered a spread for 2 contracts, I have to put up $1,000. Next, If I have to exercise, and present the stock to the $160 call buyer, I will effectively pay $160.97 for the shares ($155 + $5.97 for the option premium). The stock could drop below $160. Well, since I paid a net $3.44 ($5.97 – $2.53) to enter the spread, my breakeven point is $158.44 ($155 + $3.44). As long as the stock stays above $158.44 I won’t lose money. This does not mean that I want to wait until it hits $158.44 to bail out, but, since that is the point where I will start to lose money, it is certainly a target I will keep in mind. So I risk $1,000 for a $312 return. Seems ok to me. IBM reported outstanding earnings. Steve Jobs can’t tank it by going on medical leave. Hulu can’t compete with it by offering lower priced movies. Priceline can’t compete with it by offering lower priced tickets. I think I’m good for the next three weeks, unless the general market slides because of some riots in a foreign country, or something equally stupid. I’d like to welcome you and all our new members. It’s quite humbling to me and my team to see how this site and membership has grown over the past few years. Regarding my upcoming book as always it is taking longer than anticipated mainly because I have decided to enhance the formatting. It is interesting to see the metamorphosis of a book from the initial outline to the end product. There is so much information in this book that I decided to add a chapter outline at the beginninjg of each chapter and a Q&A at the end to highlight the key points. I’m anticipating a release in the summer. Thanks for asking. What is the difference between doing the call spread as you describe and doing a put spread selling the 160 and buying the 155. As I see it you risked $1,000. plus your $688(3.44 x 200) that you paid to open. With the put spread you would risk the $1,000. less the premium rec’d. The breakeven point would be about the same. I’ve been reading up on vertical spread since there were so many post on it lately. if I’m not mistaken, your’s is a bull call spread (debit) and Mark (#23) is a bull put spread (credit). I’ve very interested in it. Please make sure I have this right. * Aren’t you risking $688 for a $312 return? * ROI – Since your max loss is what you paid/risk/invested, shouldn’t it be 312/688 = 45.3% return? I was wondering where the 30 stocks # comes from. As the “white stocks” in the Running List number 18 by my count? The running list is composed of TWO pages, page #s 3 and 4 of the premium report. You may have looked at only one of those pages. You are correct. My spread would be considered a “bull” spread. So would buying a $155 put and selling a $160 put. The reason I chose the call spread is it is easier to make a stock go down, than up and $160 was too close to sell a put, for me. Remember last week when FFIV closed at $109.97? The $110 put sellers got hit. Ken, your calculation is correct. However, I am a CPA and our “conservatism” rule says don’t count your income until you have actually earned it. I will know on Feb 20 what my true return was. Also, even if I am using a net debit spread, I do not consider the cash to actually be mine until the trade is closed. It might jinx me. Mark, we are both wrong. I paid $688 to get into the spread. I need to go back and see if they actually set aside the $1,000. The most I can lose is the $688. If IBM goes to $12, both calls expire worthless and I am out $688. If it goes to $300, both calls get exercised and I make my $312. Ken is correct. $312/$688=45.35%. I think I will enter several more spreads. Owen, the paragraph in the middle of your #27 could have come out of my pen. That’s what I meant two weeks ago. . . Here is an example of a previous discussion about closing out a position early when it reaches 10%-20% of the original option premium. I didn’t even consider the percentage. I see $46. On Jan 25 I sold an FFIV Feb $100 put for $2.20 and bought the FFIV Feb $90 put for $0.52. Total net profit, if the stock stays above $100, is $168. Right now I can close the position out for $46. Should I give up $46 for the remaining three weeks and “settle” for $122 of the $168 potential profit? Or, should I hold out three more weeks and hope the stock does not reverse? 12.2% in one week, or 16.8% in four? I can still enter another spread which may make me another $165. Ah, choices, choices. Too many choices. That makes you only 100 bucks. . . ., but in tree days, instead of 3 weeks. And you can do this another 2 times before Feb 19, when your FFIV is to expire. And the amounts for the next two times will probably be higher. Not a bad idea. I will give it a little thought before 4PM today. I am tend to be a diciple of the slow dime vs the fast nickel theory of investing. Thanks for the suggestion. I was not sure if the the “other Stocks” and CANSLIM(IBD) stocks should be included. I put on your Priceline spread for this Friday. Looks nice next to my Feb 19 $450/$455 spread. PCLN had quite a jump today. I’m starting to get nervous. All stocks in the “white” cells of the running list have passed the strict fundamental, technical and common sense BCI screens and are eligible for 1-month covered call writes as long as earnings reports do not interfer. In my first book, “Cashing in on Covered Calls”, Chapter 16 is devoted to “Additional Sources For Locating the Greatest Performing Stocks”. Since then the BCI team has been using additional resources. For example, if I or a team member notices a stock with a stellar earnings report we will put it through our system screens. From time to time we will find a “gem” and add it to the “other stocks” section of our running list. Thanks for asking the question as it allowed me to clarify this issue with all our members. Did you still get a decent price. Owen? I see the spread closed at $0.65 net/credit. Yeah, the $6 peak at around 11:10 was amazing. Dirk, I did get a decent spread, $0.91. Close enough. If it is successful it will be a 9.1% return for three days. We do need to avoid getting too greedy here. We started with covered call writing, willing to accept 1% to 3% per month, which is a very good return. We have to be careful we do not give the impression that 9% a week is easy to do. Return on an investment is almost always has an inverse relationship to the risk taken. If you want zero risk, you put your money in an FDIC insured account. If you are getting 1% per month you have taken on the risk that a good stock will not perform as anticipated. To get 9% for three days I am risking that a VERY expensive and volatile stock will jump $15, from $438 to $453. That is certainly not out of the realm of possibility. Therefore, any of the other BCI reading this are being warned, this is much riskier than the covered calls we usually trade in. DO NOT TRY SPREADS UNLESS YOU ARE ABSOLUTELY SURE YOU HAVE THE MATH DOWN CORRECTLY AND YOU UNDERSTAND THE RISK YOU ARE TAKING. I started using your calculator and was wondering why there is no downside protection when you sell an out of the money option. If you sell an option for $2 aren’t you protected by $2? This is a stock (wireless technology) currently on our premium watch list. On October 27th it reported a stellar earnings report with earnings up 16% and revenues rose 22%. This cash-rich company has been buying back shares and just announced a 4th-quarter dividend. The next earnings report is due out on February 23rd. Despite recently reaching a 2-year high, IDCC trades at a reasonable 15.6 forward PE and boasts a ROE of 62.6%. Check to see if this financial soldier deserves a spot on your watch list. Totally with you on your #36 Owen!! I am in the lucky(or maybe not) position, to have the time to watch my spreads all day long. I would not even consider being half a day or so without computer, notebook or smart phone. Especially the weeklies can bite you heavily. It was a expiration Friday for the weeklies combined with some bad news and hell broke lose. The big guys have been selling and the prices dropped like water out of a bucket. That is especially bad on a stock with a weekly expiration, where there is no time for it to recover. I had to bail out of two spreads. Since it was only 2 hours to expiration; the give-back was not too bad and I still made money. 2 others I watched with sweaty palms. As Owen pointed out, those stocks are mostly high priced and can be very volatile, when seen the Dollar amount. If a 450 Dollar stock drops 15 points on exp. Friday, that means usually buying back the short leg of the put spread, no matter what is costs you. Getting exercised on put is not an option (at least not for me) with a stock in this price range. Let’s say, you made the put spread with 5 contracts, then you would have to come up with 225 000 bucks for the above mentioned 450 Dollar stock. The above $15 drop in price is only 3.3 % of the stocks price. If this happens to one of our 30 Dollar stocks for writing covered calls, that 3.3% amounts to only $ 1, which is often easily covered by our premium, we received. No sweaty palms, enough time to expiration for the stock to recover and not sitting 5.5 hours in front of your computer per day. It makes me do more research of possible strike prices, combinations of put spreads together with call spreads, going back into the history of the particular stock to see how it behaved before and after an ER, before and after a dividend distribution and compare t to other stocks where have been big drops or shoot ups in the past. Just look up the difference in behavior of Priceline (PCLN) and IBM in May last year. PCLN dropped around 80 points, (30%) and stayed there for 1.5 months, whereas IBM lost only 8 points (6%) and traded sideways for 3 month. Big difference in behavior and this is reflected in the premiums. PCLN trades for 438 today and the 445 call premium is $2.15, whereas IBM trades for 163 and the 165 call premium is 52 cents. Of course all that comes with a price tag. Owen, Alan and others pointed it out a million times already. Higher premiums are tied to higher risk and sweaty palms (and couch sometimes). It all depends on your risk tolerance. The downside protection is the protection of our premium. The 2 Dollars, you mentioned for the ITM call, is the amount to our break even point. Thanks Dirk. That makes sense. Let’s look at my psuedo covered call spread in IBM at today’s close. As discussed before, instead of buying 100 shares of IBM for $160.08, I bought a Feb $155 call for $5.97. I then sold the Feb $160 call for $2.53. My potential gain, if the the calls both get exercised is $1.56 ($162.53 – $160.97). If I had bought the stock for $160.08 my potential gain would have been $2.45. So, I gave up $0.89 of profit for only putting up $1,000, instead of $16,080. Today IBM closed at $163.30. The $155 call is $8.25, so there is no time premium left. The $160 call is $3.90, only $0.60 time premium left. That translates to $60. Since the profit I am shooting for is $156, I think I will hold out a little longer. I have a $3.30 cushion under my trade, so let’s see what happens in the next day or two. For the BCI, this is not an outrageous departure from our covered call trades. I could have bought the stock at $160.08 and sold the $160 call. Instead, I bought the right to buy the stock for a net of $160.97 and sold the $160 call. If I had $10,000 to invest I would not be able to do a true covered call for IBM. Why is this an important concept? Diversification. One of the priniples that Alan teaches is picking a few different stocks from a few different industries. That way if one company, or one industry, has a bad week, or two, you will not risk your entire investment pool. So, if you put $3,800 into a $38 stock and sell the $40 call, you can add a $160 stock for $1,000 using a call spread like the one I have for above. 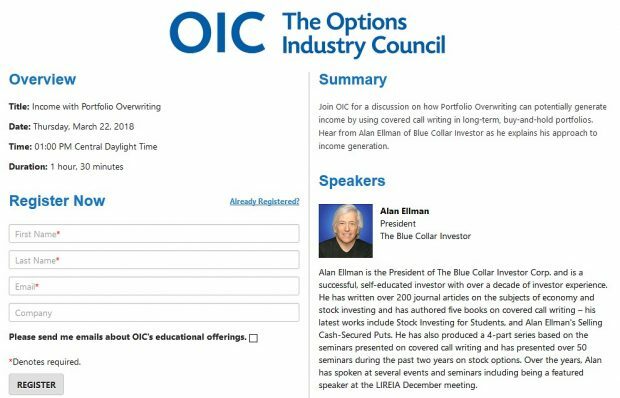 Now, your investment choices can include NFLX, PCLN, AAPL, etc, if they meet the screens that Alan suggests you use. Remember, any departure from his rules is not forbidden, but it adds an elelment of risk that you may not want to take. I don’t think the call spread is a good choice for a $38 stock because the option premiums generally don’t offer the spreads that the higher priced stocks do. Last month I bought RVBD stock and sold a call, because the return was good and the option premium worked. that is exactly what I forgot to mention in my post today. If I don’t have enough resources to be properly diversified, then a spread is a nice way to buy a call as a stock substitute and go in a different industry with stocks I could not afford before. Check out aixg. Past all screens and has earnings on March 1st. Options trade in $1 increments. Can still make some good returns for February contracts. Alan, am I correct in my observation of the Feb week 2 weeklies that, with no open contracts today, that the weeklies start trading on the previous Thursday? I suppose they update the open interest in the evening. Because it shows current volume for the weeklies ending at Feb.11, but no open interest. Let me confirm Dirk’s response. Since these weeklys were introduced today, open interest will be calculated after market closes tonight and be available several hours before market opens tomorrow. From that point on you should see open interest for the remainder of the week. This week’s report of top-performing ETFs has been uploaded to your premium site. New members: if you didn’t receive a direct email notifying you of this upload, please let me know and I’ll add your name to the premium mailing list. A friend recommended CRR. It shows 6 greens, good scouter and nice chart. A negative is that its expensive! Any thoughts on this one? CRR might be on a high run. When I look at the history (1 year chart) it always has been running up for the ER and the dividend and then dipped. If it follows this pattern it might dip just when you got in. The premium is appealing right now. If I would buy it right now, I’d go ITM. Lets say $ 115. That gives you still a nice premium for February of $3.60 with some downside protection. Thanks Dirk. I appreciate the advice. CRR is a great example of a stock for which a credit spread could be considered (I think!). I am still learning this strategy and have been paper trading from Jan of this year. But there are experts here and its better to wait for their comments. Since this stock is sound technically and fundamentally and the general market (from IBD today) is “Confirmed Uptrend” (even though the market might plummet due to jobs data today), my outlook on the stock would be mildly bullish. So I could consider “Bull put spread”. My online broker requires a margin equivalent to (higher strike-lower strike)*number of contracts*100. If I select a put spread at 110/100, (sell 110 Put @ +$0.85 and buy 100 Put @-0.3), I would get a net credit of .55 . This means that my return on margin would be 55/1000=5.5% for 2 weeks. Now I wouldnt use any exit strategies unless the stock price dangerously approaches $110, at which point I will just reverse the above (maybe for a loss) and get out. do you think the above is reasonable? You have the math down and you have the concept down. I haven’t looked at the stock, but if you are comfortable with it you are on the right track. That would be too tight for my taste. Watch the stock every day and look at the Theta. The strike $110 is now at -0.08, meaning that the time decay will be 8 cents per day. That is in your favor. Set yourself a point, that you buy back the short leg at maybe 20% of your received net/credit. That gives the stock some leeway, pays for the commissions and a small lunch. I would agree with Dirk, there isn’t enough profit potential to be worth the risk. I try to always look at the dollars and not just percentages. We get sucked in by what we think is a good return. In this case 5.5% for two weeks sounds good….but look at it another way. You’re getting $55. but take off commissions to get in and possibly out. With my broker doing combo orders its $10.75 in and $10.75 out per contract so $21.50 off the $55. leaves you with $33.50 potential profit for a risk of $1000.- $55. =$945. Not worth it. Don’t forget how quickly you can lose on these spreads. Until you’ve had one go against you, you can’t appreciate how fast and deep the loss can be. They are not like covered calls. When they go bad it’s fast. Having said that I’m doing spreads but be carefull and don’t say the all of us didn’t warn you when you get bit because you will. And btw., the 20% stop loss idea is from Mark. We are still playing around with ideas to make the exits more automatic, that we don’t have constantly price trigger alerts on our phone and have to jump in the next internet cafe, to see what is going on. Too much coffee is unhealthy! The problem with the % rule is, that it might trigger the same day already for normal stock movements. We have to give it some time to decay. . . When you consider spreads; as Owen and others pointed out already, to have a decent risk/reward ratio you have to deal with more volatile stocks. Volatility, if properly observed, can be your friend. It was dancing around at $37 all morning and then, at around 11:10 it dove down to 433.50, which brought the price for the puts up. That gives me a $60 return on $1000 for just one week. Now the spread is only $45. I guess, if Bernie Madoff’s 12% annual returns were too good to be true, the 9% I made this week on the PCLN weekly does not exist. still 21 minutes to go. Not to brag (ok…..maybe a little) I guess I’m a bigger risk taker than you. Except for jumping out of a perfectly good airplance. I beat Bernie, I made 14% on mine and if GOOG doesn’t drop below $600. in the next 15 minutes I’ll make 12% on it. And Dirk my PCLN is in the pocket. Dinner on me tonight and no couch this weekend. Are you crossing your fingers for my short 220 call of NFLX??? Dirk, I didn’t have 21 minutes to go. I closed it this morning, and entered a $455/$465 call spread for next Friday. That was why I entered the comment about the weeklies for next week showing up yesterday. I had not really looked that closely at them, and I thought they opened on Monday morning for that Friday. The previous Thursday makes perfect sense for those who want to roll forward, like I did. Anyway, I got my 9% for this week. I will know what return I will get on the new spread next Friday. A company I use in my dental practice gapped up today on a positive earnings surprise. Could be a good candidate for our watch lists when the price settles. I just said it privately in an email, but I want to say it publicly, here. Thank you, Alan. You have changed many lives, and the BCI appreciate all the effort you have put into sharing your experience with us to improve our finances. You have proved, beyond a shadow of doubt, that you do not have to be thirty-something Wall Street go-getter to make a decent return off Wall Street. I was wondering the opinion of others regarding the length of the opinion period. I have done a couple of trade as described within the “four corners” of all the analysis. The issue is after the Jan expiration period I had to choose between 7 weeks and 3 weeks option period. I have seen Alan select a 6 week period rather that a 2 week period when handling the covered call 2 weeks after the expiration period has transpired. The yield are higher ( a bit ) with the longer 7 week deal but the IRR% is lower. Any thoughts on this duration issue??? Alan has found, through many years of experience, that the following month options are the best. Going out too far delays your opportunity to collect your gains and decide what to do next. The reason you would go out 6 or 7 weeks is, in some cases, you have found a good stock, but the option premiums on the current month do not provide reasonable returns. For instance, we are already two weeks into the Feb 18 call month. You may get a better return, if you have money to invest right now, going for the March options, rather than the February options, which only have two weeks left. Just be sure to check the projected earnings reports to make sure the stock won’t report in March before the options expire. I found that the dollar gains were so small on the deal with the shorter option duration. Thus part of the motivation for the 6 or 7 week duration. My two stock TXN and XLNX were almost immediately in-the-money though they started as out of the money CC. BTW- Interesting looking at FFIV – AGAIN! FFIV is a good example of the activity that can happen immediately before and immediately after an earnings report. Often a stock will react to the estimated numbers the street expects and, after the actual report comes out, react to the difference between what was expected and what actually got reported. Then there is the collection of pundits who spend the next couple of days telling everyone who will listen what the numbers mean and why the stock behaved the way it did. This is why it is best to avoid a stock with a pending earnings report and for a few days or a week after the earnings report to allow the stock to get back into its groove. Just keep in mind that FFIV reports again on April 20.